Chime’s research team surveyed 1,262 people age 21-35 using SurveyMonkey Audience to understand Millennials attitudes and behaviors when it comes to matters of personal finance. In part one of the study, we looked at what they want in a bank today. Here in part two of the report, we take a closer look at the budgeting and saving challenges faced by this debt-saddled generation. Our study shows that the vast majority of Millennials believe budgeting and saving money are important, and they’re looking for ways to automate their finances to grow their savings. Yet a significant number have yet to adopt budgeting and savings tools and behaviors. Student loan debt is holding Millennials back. More than previous generations, Millennials are struggling with debt, particularly due to the skyrocketing cost of college education. 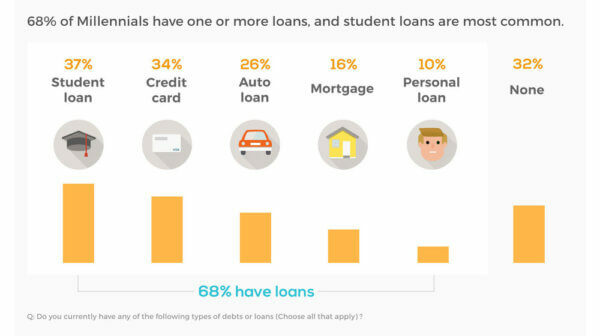 As we saw in part one of this study, 68% of Millennials have one or more loans with the most prevalent being student loans followed by credit card debt, auto loans, and mortgages. It’s no surprise then that Millennials are opting for debit cards over credit cards as a way to have more control over their spending to help them get out of debt as quickly as possible. Among those with a student loan, almost 40% say they won’t pay it off for at least 10 years, and 25% say it will take them 15 years or more. That means they’ll still be paying off their student loans in the year 2030, or into their forties. Budgeting and savings habits are lacking. Just about everyone thinks it’s important to set aside money for savings, but it’s not something people love to do. 93% of Millennials say it’s important to regularly set aside money for savings. Yet about 40% of Millennials don’t regularly save or budget. While most Millennials understand the importance of budgeting and saving, putting healthy financial habits into practice is another story altogether. 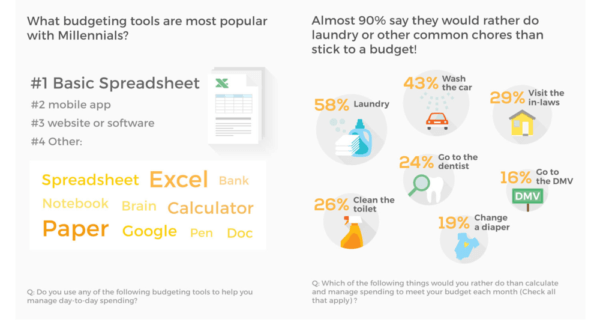 Almost 90% say they would rather do laundry or other common chores than stick to a budget. Among those who do regularly budget, most are using basic budgeting tools like a spreadsheet, or pen and paper. For most Millennials, the typical savings account interest rate is so low that it’s not a factor when it comes to choosing where to put their savings, and it’s not motivating a regular savings habit. What they do want is a way to automate their savings. 75% said interest rate isn’t a factor when choosing a savings account. At least 65% say they’d like to have a way to automatically set aside money for savings. What do these findings mean for the finance industry? Our study shows that although Millennials are struggling with debt, they understand the importance of budgeting and saving. However, many have not found the tools or routines to help them make saving money a regular practice. It’s time for financial companies to develop better ways to solve the budgeting and saving challenge. This means reducing the cognitive overhead associated with budgeting, moving past complex charts and planning tools, and automating savings so that people can easily manage their finances without having to work hard at it.